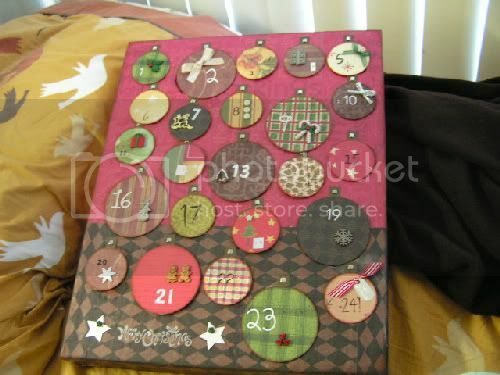 Thinking about crafting an Advent Calendar? Yeah, me too, and so I thought I’d find a few projects to share. My critierion for this round-up is that they have to be SIMPLE…because the first of December is right around the corner! This is a super-cute and RECYCLED craft, using styrofoam. The is a full tutorial on Craftster, but the idea is that you cut holes in the styrofoam, decoupage the face, and then cut the cardboard circles and attach them with brads to make little swinging doors. Cute and ec0-friendly! Thank you, Burstandbloom. You are a crafty diva. Here’s another cool, recycled calendar idea from DIY Father: he uses matchboxes mounted on cereal-cardboard stars strung into a garland. I LOVE the idea of the kids being able to help out and paint and glitter up the stars,while the parents get all sneakyand fill up the goodie boxes! I think you could probably use some heavy-duty magnets and a cookie sheet, too, as long as the trinkets inside weren’t too heavy. Lastly, KidCraftWeekly has a trifecta of Advent Calenders: One made with simple manilla envelopes, one with origami boxes, and the last as traditional matchbox calendar. There are links to the origami (cup) boxes here. OK, enough of the eye candy! I think I’ve got some envelopes upstairs, so I bet I can whip out that version today. certificates for: hugs, walks, playing games, etc. These are fabulous, can’t wait to go home and make my own! Thanks, Lisa. PS- love your site! OH how I wish you could come and design my art loft. *sigh*! I thought about making an advent calendar, but I thought of it about halfway through December. Oh well!